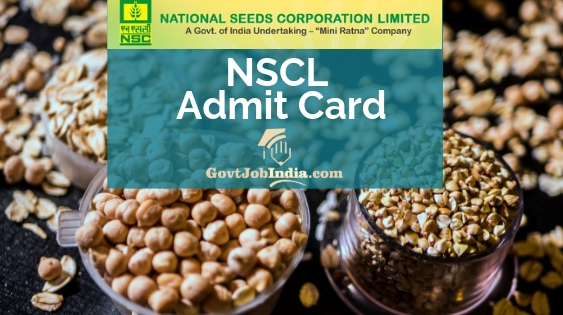 NSCL Admit Card 2019 Download– The National Seed Corporation Limited will soon issue the NSC Admit Card 2019 for the posts of Deputy General Manager (DGM) (Vigilance), Assistant (Legal) Grade-I, Management Trainee, Senior Trainee, Diploma Trainee, Trainee and Trainee Mate for the year 2019. Aspirants who want to know more about the NSCL Call Letter should keep on reading till the end of the article. In this article, we have covered all the key pointers of the NSC Admit Card and candidates will get to know everything about this if they read this article completely. You will know details like the Seeds Recruitment Admit Card release date, exam dates and what all you need to carry to the recruitment hall. The National Seeds Corporations Limited has rescheduled the written examination to 14th April 2019. Candidates can download their Admit Card from the “How to Download” section given below. On the homepage, you will find the NSCL MT Vacancy Call Letter 2019 as an update. Click on it and you will be taken to another screen. Please enter your registration details (Date of Birth and registration number) on the screen. Submit the information and your Seeds Recruitment 2019 Admit Card will be on the screen. Download it using the shortcut (CTRL+D) and also take a printout of it. Thus in 5 easy steps, you would get the examination call letter in your very own hands. GovtJobIndia.com team has compiled all the information from the official advertisement and other credible sources about the National Seeds Corp Admit Card 2019. We also promise that any information which we lack in this article will be delivered to you as soon as it is available. So, what we are saying is that we will be constantly updating this page with all the latest news which comes up. So, ensure that you do not miss out on any updates about the NSC Call Letter 2019. In case you have any doubts related to this, comment below and we will clear it out soon. The NSCL recruitment was conducted for a whopping number of 264 vacancies and candidates applied for it from all across the country. Check out the details of the National Seeds Corporations Limited Recruitment 2019 here. So, let us continue with the NSCL admit card details. But prior to that let us just go through the recruitment details. Candidates have to take some additional documents to the exam hall including the NSCL MT admit card. One will have to be an identification proof and also carry a photocopy of it. Carry with you, a few of your recent photographs. Hope you found this article about the NSCL Hall Ticket 2019 useful. Comment below if you have any doubts related to the NSCL Admit Card Download and our Team will get back to you as soon as possible. In the end, make sure to subscribe to our website @GovtJobIndia.com for latest updates of recruitment which spans across the country. We hope that you will surely get selected for the excellent opportunity provided by the National Seeds Corporation Limited which is the NSCL Management Trainee Recruitment 2019. When will we get Admit card for NSC examination? ?